At Brooch the Possibilities, we are proud to have received the following recognition and have been invited to participate in various shows in Florida. ​You can view my designs on the knot click on the link on the top of the page! Featured on TV "Fashion 4ward"
"The team of Jacksonville Wedding Styles Online Magazine and the Bridal Fantasy Events of Jacksonville would like to thank Kathy Knerr of Brooch the Possibilities, St Augustine FL for her dedication, and time spent to make the incredible conch shell brooch bouquets for the "Something Blue" runway bridal fashion show" What an incredibly beautiful and unique addition to the show! If you're having a wedding where it's warm, or just want to add a romantic touch of the sea to your wedding, these are perfect! But, no matter what your theme or setting, Kathy's incredible one-of-a-kind brooch bouquets are ultra romantic and some of the most beautiful in the business! She has been featured 2 years in a row at the Bridal Fantasy Fashion Show, and has also been featured on WJXT4 The Local Station's "Fashion 4ward" segments with Celebrity Fashion Stylist, Beth Sullivan! Visit her FB page today! "Kathy is truly an artist. When I finally received the finished product (I was DYING to see it! ), it was more beautiful than I could have ever imagined and hoped for. When I was describing it to friends, three words kept coming up over and over: beautiful! stunning! and gorgie! I simply cannot wait to carry it down the isle and display it in our home.athy is truly an artist. When I finally received the finished product (I was DYING to see it! ), it was more beautiful than I could have ever imagined and hoped for. When I was describing it to friends, three words kept coming up over and over: beautiful! stunning! and gorgie! I simply cannot wait to carry it down the isle and display it in our home." It has been a joy working with this company. She makes the most beautiful arrangements.=) "
"My headband is one of a kind and it has the vintage look that I was aiming for Kathy is creative and really knows how to make your ideas come to life I love my headband and recommend her for weddings for anyone!" " Love Miss Kathy, she is very professional and the work she does is amazing!! Can't wait to see Mya's bouquet ." "I Absolutely adore my bouquet! I couldn't stop staring at it because it was just so amazing!! I can not wait to show it off in two weeks. I know everyone will be in awe! Thank you so much for making that special touch on my big day!" "I first discovered Brooch the Possibilities at a Bridal Expo in Jacksonville, and I immediately LOVED the designer's work and appreciated the time she took to speak to me individually that day. The designer did an incredible job on designing and creating my wedding bouquet with turquoise and gold broaches and jewelry pieces. My mom had a lot of fun collecting all of the pieces to include in the bouquet; some were special to the groom and me and others were just pretty pieces my mom found at stores. We gave all of these pieces to the designer, who used her own creative vision, craftiness, and talent to create a truly beautiful bouquet for me. I can't wait to show it off at my wedding in 3 weeks and to display it in our future home for years to come! I am definitely glad I decided to pursue this unique wedding idea as it will be a beautiful, precious, and lasting reminder of our wedding years from now. Additionally, the designer demonstrated the utmost professionalism in all interactions my mom and I had with her. From our first meeting at the Bridal Expo to the day she delivered the finished product, she was timely, courteous, personal, and involved me in the designing process the entire way to make sure I got exactly what I wanted in my wedding bouquet! I HIGHLY recommend Brooch the Possibilities! "You truly are talented and got my vision quick! I loved working with you and cannot wait to walk down the isle holding that gorgeous bouquet that I will be so lucky to pass down to my future kids! You are the BEST! 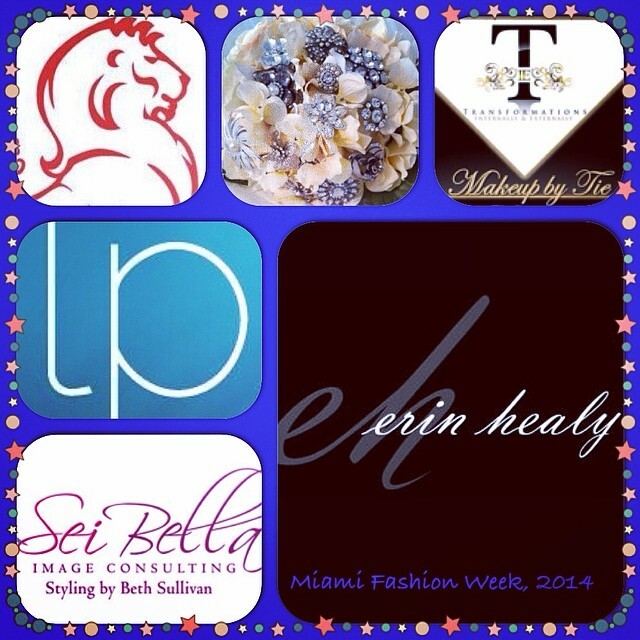 Spacecoast Fashion Week 2014 Joined Erin Healy in Textures Etc Spacecoast Fashion Week March 8 - 16th 2014. Six of my head pieces were worn by the beautiful models wearing Erin Healy Designs! Thank you Erin and Beth Sei Bella Image Consulting for showing my work! ki & i pet collar couture designs launched on WJXT Channel 4 local news on April 1, 2014. View the video on my FB page! 1 Spark in Jacksonville Thank you Severine Photography view the video on my FB page it is amazing! "Kathy was very professional to work with. She asked many questions up front to find out what I was looking for, and sent pictures along the way so I received the best customized broach bouquet possible. The price was very reasonable compared to other vendors in Florida. I could not be happier with my broach bouquet. We just got pictures back from our wedding, and I love how well the bouquet goes with everything! "